420 Delaware St SE, Minneapolis, MN 55455, USA. BACKGROUND CONTEXT: Chronic neck pain is a prevalent and disabling condition among older adults. Despite the large burden of neck pain, little is known regarding the cost-effectiveness of commonly used treatments. PURPOSE: This study aimed to estimate the cost-effectiveness of home exercise and advice (HEA), spinal manipulative therapy (SMT) plus HEA, and supervised rehabilitative exercise (SRE) plus HEA. STUDY DESIGN/SETTING: Cost-effectiveness analysis conducted alongside a randomized clinical trial (RCT) was performed. PATIENT SAMPLE: A total of 241 older adults (≥65 years) with chronic mechanical neck pain comprised the patient sample. OUTCOME MEASURES: The outcome measures were direct and indirect costs, neck pain, neck disability, SF–6D-derived quality-adjusted life years (QALYs), and incremental cost-effectiveness ratios (ICERs) over a 1–year time horizon. METHODS: This work was supported by grants from the National Center for Complementary and Integrative Health (#F32AT007507), National Institute of Arthritis and Musculoskeletal and Skin Diseases (#P60AR062799), and Health Resources and Services Administration (#R18HP01425). The RCT is registered at ClinicalTrials.gov (NCT00269308 ). A societal perspective was adopted for the primary analysis. A healthcare perspective was adopted as a sensitivity analysis. Cost-effectiveness was a secondary aim of the RCT which was not powered for differences in costs or QALYs. Differences in costs and clinical outcomes were estimated using generalized estimating equations and linear mixed models, respectively. Cost-effectiveness acceptability curves were calculated to assess the uncertainty surrounding cost-effectiveness estimates. RESULTS: Total costs for spinal manipulative therapy (SMT) + home exercise and advice (HEA) were 5% lower than HEA (mean difference: –$111; 95% confidence interval [CI] –$1,354 to $899) and 47% lower than supervised rehabilitative exercise (SRE) + HEA (mean difference: –$1,932; 95% CI –$2,796 to –$1,097). SMT+HEA also resulted in a greater reduction of neck pain over the year relative to HEA (0.57; 95% CI 0.23 to 0.92) and SRE+HEA (0.41; 95% CI 0.05 to 0.76). Differences in disability and quality-adjusted life years (QALYs) favored SMT+HEA. The probability that adding SMT to HEA is cost-effective at willingness to pay thresholds of $50,000 to $200,000 per QALY gained ranges from 0.75 to 0.81. If adopting a health-care perspective, costs for SMT+HEA were 66% higher than HEA (mean difference: $515; 95% CI $225 to $1,094), resulting in an ICER of $55,975 per QALY gained. 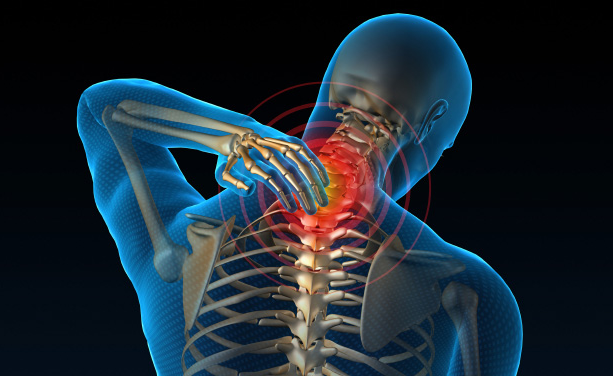 Background Spinal pain is a common and disabling condition with considerable socioeconomic burden. Spine pain management in the United States has gathered increased scrutiny amidst concerns of overutilization of costly and potentially harmful interventions and diagnostic tests. Conservative interventions such as spinal manipulation, exercise and self-management may provide value for the care of spinal pain, but little is known regarding the cost-effectiveness of these interventions in the U.S. Our primary objective for this project is to estimate the incremental cost-effectiveness of spinal manipulation, exercise therapy, and self-management for spinal pain using an individual patient data meta-analysis approach. Methods/design We will estimate the incremental cost-effectiveness of spinal manipulation, exercise therapy, and self-management using cost and clinical outcome data collected in eight randomized clinical trials performed in the U.S. Cost-effectiveness will be assessed from both societal and healthcare perspectives using QALYs, pain intensity, and disability as effectiveness measures. The eight randomized clinical trials used similar methods and included different combinations of spinal manipulation, exercise therapy, or self-management for spinal pain. They also collected similar clinical outcome, healthcare utilization, and work productivity data. A two-stage approach to individual patient data meta-analysis will be conducted. METHODS: This work was supported by grants from the National Center for Complementary and Integrative Health (#F32AT007507), National Institute of Arthritis and Musculoskeletal and Skin Diseases (#P60AR062799), and Health Resources and Services Administration (#R18HP01425). The RCT is registered at ClinicalTrials.gov (#NCT00269308). Care from a general practitioner (GP) is one of the most frequently utilised healthcare services for people with low back pain and only a small proportion of those with low back pain who seek care from a GP are referred to other services. The aim of this systematic review was to evaluate the evidence on cost-effectiveness of GP care in non-specific low back pain. We searched clinical and economic electronic databases, and the reference list of relevant systematic reviews and included studies to June 2010. Economic evaluations conducted alongside randomised controlled trials with at least one GP care arm were eligible for inclusion. Two reviewers independently screened search results and extracted data. Eleven studies were included; the majority of which conducted a cost-effectiveness or cost-utility analysis. Most studies investigated the cost-effectiveness of usual GP care. Adding advice, education and exercise, or exercise and behavioural counselling, to usual GP care was more cost-effective than usual GP care alone. Clinical rehabilitation and/or occupational intervention, and acupuncture were more cost-effective than usual GP care. One study investigated the cost-effectiveness of guideline-based GP care, and found that adding exercise and/or spinal manipulation was more cost-effective than guideline-based GP care alone. BACKGROUND: Low back pain (LBP) is a major health problem, having a substantial effect on peoples’ quality of life and placing a significant economic burden on healthcare systems and, more broadly, societies. Many interventions to alleviate LBP are available but their cost effectiveness is unclear. OBJECTIVES: To identify, document and appraise studies reporting on the cost effectiveness of non-invasive and non-pharmacological treatment options for LBP. METHODS: Relevant studies were identified through systematic searches in bibliographic databases (EMBASE, MEDLINE, PsycINFO, Cochrane Library, CINAHL and the National Health Service Economic Evaluation Database), ‘similar article’ searches and reference list scanning. Study selection was carried out by three assessors, independently. Study quality was assessed using the Consensus on Health Economic Criteria checklist. Data were extracted using customized extraction forms. Interventions assessed within each category varied in terms of their components and delivery. In general, combined physical and psychological treatments, information and education interventions, and manual therapies appeared to be cost effective when compared with the study-specific comparators. There is inconsistent evidence around the cost effectiveness of physical exercise programmes as a whole, with yoga, but not group exercise, being cost effective. University of Warwick, Coventry, UK. OBJECTIVES: The purpose of this study was to systematically review trial-based economic evaluations of manual therapy relative to other alternative interventions used for the management of musculoskeletal conditions. METHODS: A comprehensive literature search was undertaken in major medical, health-related, science and health economic electronic databases. RESULTS: Twenty-five publications were included (11 trial-based economic evaluations). The studies compared cost-effectiveness and/or cost-utility of manual therapy interventions to other treatment alternatives in reducing pain (spinal, shoulder, ankle). Manual therapy techniques (eg, osteopathic spinal manipulation, physiotherapy manipulation and mobilization techniques, and chiropractic manipulation with or without other treatments) were more cost-effective than usual general practitioner (GP) care alone or with exercise, spinal stabilization, GP advice, advice to remain active, or brief pain management for improving low back and shoulder pain/disability. Chiropractic manipulation was found to be less costly and more effective than alternative treatment compared with either physiotherapy or GP care in improving neck pain. BACKGROUND: Low back pain (LBP) is a prevalent condition and a socioeconomic problem in many countries. Due to its recurrent nature, the prevention of further episodes (secondary prevention), seems logical. Furthermore, when the condition is persistent, the minimization of symptoms and prevention of deterioration (tertiary prevention), is equally important. Research has largely focused on treatment methods for symptomatic episodes, and little is known about preventive treatment strategies. METHODS/DESIGN: This study protocol describes a randomized controlled clinical trial in a multicenter setting investigating the effect and cost-effectiveness of preventive manual care (chiropractic maintenance care) in a population of patients with recurrent or persistent LBP.Four hundred consecutive study subjects with recurrent or persistent LBP will be recruited from chiropractic clinics in Sweden. The primary outcome is the number of days with bothersome pain over 12 months. Secondary measures are self-rated health (EQ-5D), function (the Roland Morris Disability Questionnaire), psychological profile (the Multidimensional Pain Inventory), pain intensity (the Numeric Rating Scale), and work absence.The primary utility measure of the study is quality-adjusted life years and will be calculated using the EQ-5D questionnaire. Direct medical costs as well as indirect costs will be considered. 1) Symptom-guided treatment (patient controlled), receiving care when patients feel a need. 2) Preventive treatment (clinician controlled), receiving care on a regular basis. Eligibility screening takes place in two phases: first, when assessing the primary inclusion/exclusion criteria, and then to only include fast responders, i.e., subjects who respond well to initial treatment. Data are collected at baseline and at follow-up as well as weekly, using SMS text messages. 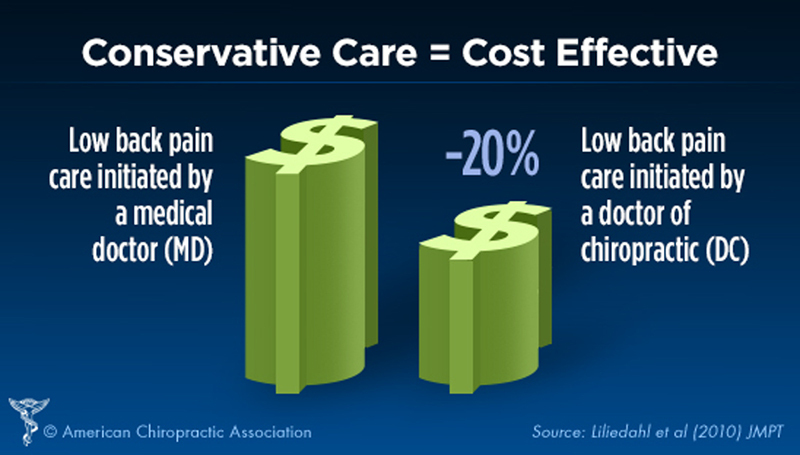 The following studies detail the cost effectiveness and overall efficacy of chiropractic care, and the procedures that doctors of chiropractic provide their patients. This study contradicts the Clinical Practice Guidelines that maintain that recovery from acute low back pain is usually rapid and complete. Their findings with 973 consecutive primary care patients was that recovery was slow for most patients, and almost 1/3 of patients did not recover within one year (when following standard medical recommendations). This study was designed to determine the one year prognosis of patients with low back pain. 973 patients with low back pain that had lasted less than 2 weeks completed a baseline questionnaire. Patients were reassessed through a phone interview at six weeks, three months and 12 months. The study found that the prognosis claimed in clinical guidelines was more favorable than the actual prognosis for the patients in the study. Recovery was slow for most patients and almost 1/3 of patients did not recover within one year. This study contradicts the common belief that low back pain will extinguish with simple core exercises. This study provided significant benefits for only 1 out of 5 LPB sufferers. Researchers followed 790 patients who initially sought care for low back pain from 70 different caregivers. After 5 years, only 21% of patients studied reported no continued pain while only 37% reported no disability. Pain and disability scores dropped significantly at 6 months, then remained flat at 2 yrs and 5 yrs. Nonspecific regular exercise did not affect recovery. Between 27% and 66% of the study population experienced a recurrence of low back pain. Background: Back pain is a common problem and a major cause of disability and health care utilization. Purpose: To evaluate the efficacy, harms, and costs of the most common CAM treatments (acupuncture, massage, spinal manipulation, and mobilization) for neck/low-back pain. Data Sources: Records without language restriction from various databases up to February 2010. Data Extraction: The efficacy outcomes of interest were pain intensity and disability. Data Synthesis: Reports of 147 randomized trials and 5 non-randomized studies were included. CAM treatments were more effective in reducing pain and disability compared to no treatment, physical therapy (exercise and/or electrotherapy) or usual care immediately or at short-term follow-up. Trials that applied sham-acupuncture tended towards statistically non-significant results. In several studies, acupuncture caused bleeding on the site of application, and manipulation and massage caused pain episodes of mild and transient nature. Conclusions: CAM treatments were significantly more efficacious than no treatment, placebo, physical therapy, or usual care in reducing pain immediately or at short-term after treatment. CAM therapies did not significantly reduce disability compared to sham. None of the CAM treatments was shown systematically as superior to one another. More efforts are needed to improve the conduct and reporting of studies of CAM treatments. The following is a collection of studies relating to the cost effectiveness and efficacy associated with chiropractic care and the procedures that doctors of chiropractic provide. The American Chiropractic Association, The International Chiropractic Association, The Congress of State Associations, and the Association of Chiropractic Colleges appreciate the opportunity to provide these materials for your review. This study contradicts Clinical Practice Guidelines that suggest that recovery from an episode of recent onset low back pain is usually rapid and complete. Their findings with 973 consecutive primary care patients was that recovery was slow for most patients, and almost 1/3 of patients did not recover within after one year, while following standard medical management. This study was designed to determine the one year prognosis of patients with low back pain. 973 patients with low back pain that had lasted less than 2 weeks completed a baseline questionnaire. Patients were reassessed through a phone interview at six weeks, three months and 12 months. The study found that the prognosis claimed in clinical guidelines was more favorable than the actual prognosis for the patients in the study.